I was not wearing my columnist hat at The Ballard Historical Society event featuring Seattle Now & Then: The Historic Hundred. In fact I was wearing a jaunty cap and a shingler’s apron that had belonged to Stuart Mork’s grandfather. I was juggling my role promoting the “Mapping Historic Ballard” project with being an audience member. Also I’d brought a comfortable chair from home, requested by historian Paul Dorpat for the event. I was not planning to write about the evening. But once I’d reached for my camera, collectively charmed by Paul Dorpat, Jean Sherrard, Clay Eals and Ken Workman, how could I deny history? Since the book launch in late October 2018, Dorpat, Sherrard and Eals have been traveling throughout Puget Sound doing presentations of the “coffee table book” which Jean Godden discussed last November. Well-known since early 1980’s for his “Seattle Now & Then” column in The Seattle Times, Dorpat’s stories behind archival photos have produced over 1800 pieces, along with books, documentaries and a blog with additional material. Since 2008 local artist, actor and photographer Jean Sherrard has been providing “then” photos, and working closely with Dorpat. I know all of this because former West Seattle Herald journalist and Southwest Seattle Historical Director Clay Eals, who has been collaborating with Dorpat for 30+ years, wrote the excellent forward to the gorgeous new book. 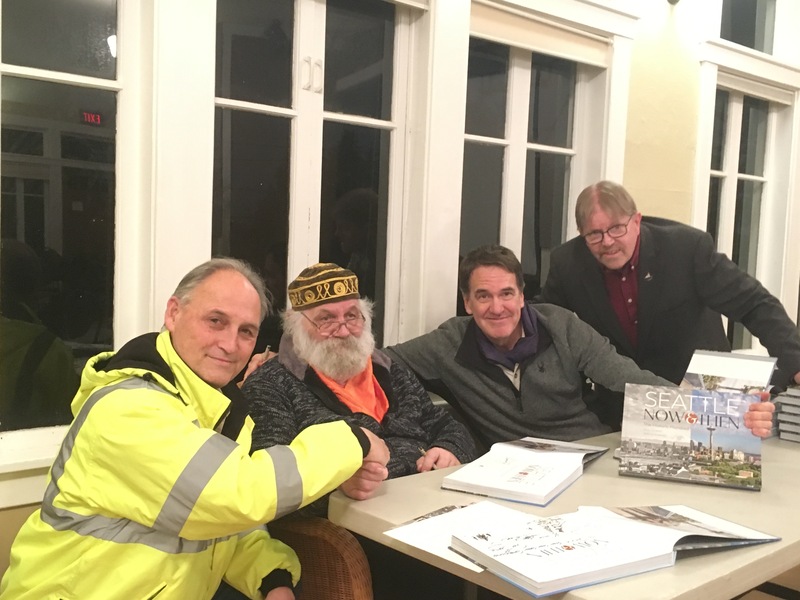 Co-sponsored by Sunset Hill Community Association the December 12, 2018 event was also an opportunity to dress for either “now” or “then,” share mulled wine and treats, and be part of the traveling comedy routine that is Dorpat & Sherrard. I was representing “then” in an effort to promote the expanded offering of the Ballard Historical Society, the results of the comprehensive street survey and analysis at www.mapping.ballardhistory.org. Since our project was subtitled “Shingletown to Tomorrow” I’d borrowed everything from the boots up to the hat (and the shingles). Anyone who has attended a presentation of Dorpat & Sherrard may be familiar with their format of showing an original photo and then a photo of an attempted recreation. Dorpat, who recently celebrated his 80th birthday, intersperses Sherrard’s more straightforward narrative with his own crowd questions and asides. The audience is asked to opine on the location of an original photo, many of which date back to early 20th Century. On this particular night, given that it was sponsored by 30 year-old Ballard Historical Society and 96 year-old Sunset Hill Community Association, the audience skewed to extremely interested, and knowledgeable. (Also, mostly familiar faces since I’ve been haunting Ballard and interviewing its denizens for over 30 years). But there was a man in the back row wearing a bright yellow coat who I didn’t recognize. The journalist and author Clay Eals had been charged with getting boxes and boxes of hefty books to the second floor of the clubhouse. Along with Gavin MacDougall he was recognized in person that night for above and beyond contributions. Ballard resident and photographer Gavin MacDougall has been transferring original columns to digital so the “past” will not be lost. As with the maps now available on the “Mapping Historic Ballard” site, the whole evening was decidedly interactive. Dorpat and his band are bringing history alive in multiple ways. They closed with a photo, circa 1890, of Kikisoblu, eldest daughter of Chief Seattle, renamed Angeline by an early Seattle matriarch. The “now” photo brought together two direct descendants, Mary Lou Slaughter and Ken Workman. They were posed near the Pike Place Market alley that descends to the gum wall. Sherrard finally revealed the identity of the mystery man in yellow. Ken Workman himself, the great-great-great-great-grandson of Chief Sealth. My husband was first to shake Workman’s hand, telling him what an honor it was to be able to do so. The subsequent sales and autographs were more like a receiving line, with Dorpat at the end, writing personal messages and fielding questions and suggestions. As the Ballard Historical members restored the venue, Sherrard and Eals took advantage of Dorpat’s presence to have him autograph ahead for bookstore deliveries. I learned that it’s not really over until the guest of honor vacates the chair, especially when it’s your chair.